And, the answer to the question you have wanted to ask – Removal of 47 year old Sugar Maple – $1250 — Purchase and Planting of a 12 year old Sugar Maple – $1400. But I have continued the photographically documented 150 year tradition, and I’m happy I did. Overwhelmed with play preparations (opening night this coming Friday, 16 June) for Old Home Days through the 25th, has impacted upon adventures, but also caused some action on my behalf for safety sake. My maple tree in from of my home was dying, dropping dead limbs from the top, and I did not anyone hurt. Sadly, I knew the tree must go, and on Monday the 5th, another difference with the trees at “44.” Below, now a “new look” at “44” – the stump has since been ground away. 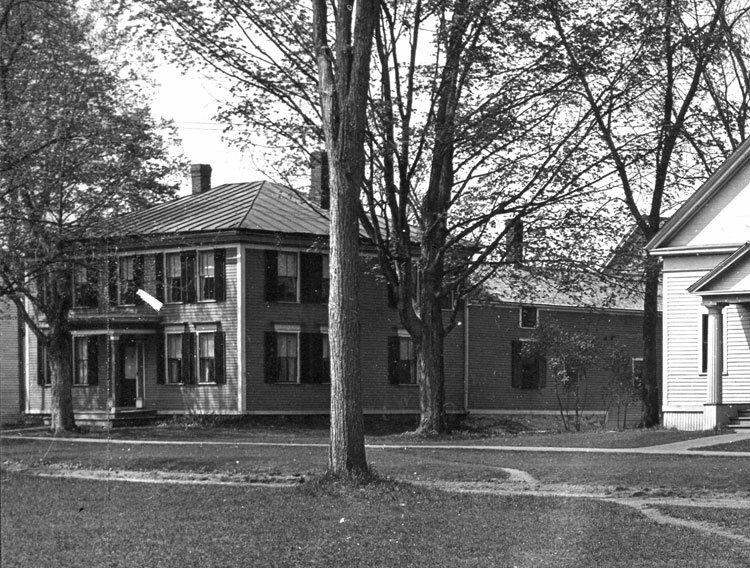 My home from the front is essentially as it was when built in 1806, except the “trees have changed.” Well, the original attached barn decayed and was removed in the late 1960s. The couple I bought from added an attached garage in 1971 (where the barn was), Then I added the “book shop” beyond the garage when we bought in 2002, and my almost four season porch was completed in 2007. 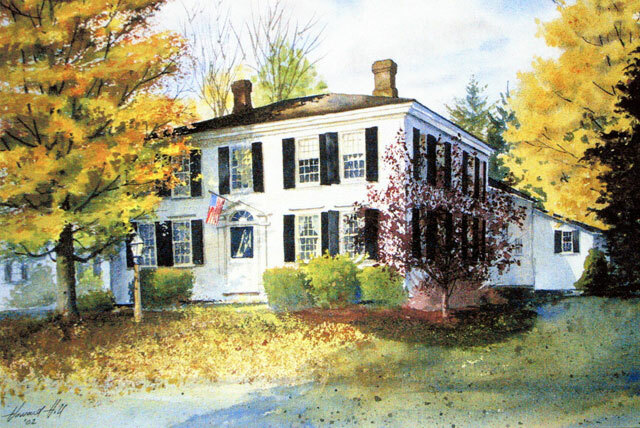 Cathy commissioned a local artist, Howard H. Hill to paint our home when we purchased in July 2002, thus documenting it at that time. The red maple of the right of the house expired, and in time I removed the inappropriate plantings in front of the house. Inappropriate for what would have been the early 19th century appearance. But, you can see the majesty of the sugar maple on the left. Jerry and Diana purchased my home in February, 1971, raising their children here. 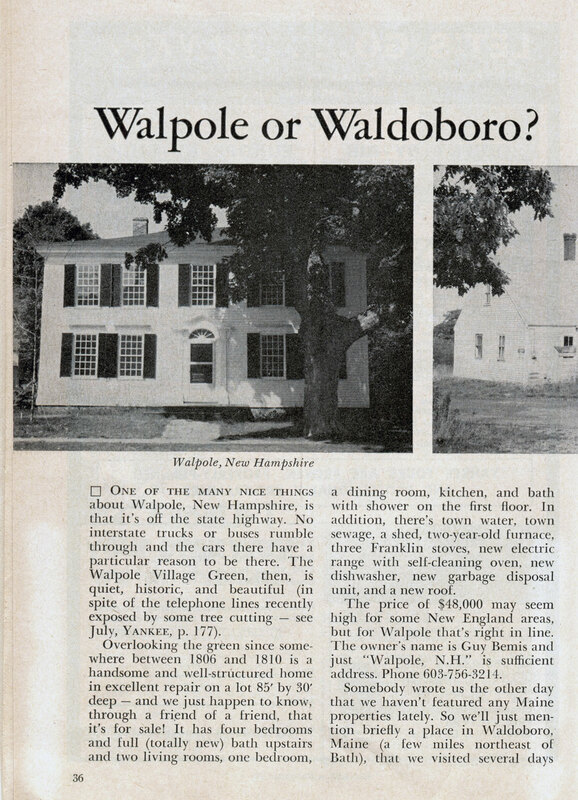 When they bought, that sugar maple had recently been planted by Guy Bemis (Mr. Walpole) who had saved the house from disrepair. Jerry gave me two polaroids that he took upon their purchase, and you can see the baby maple, and a massive one on the right (remember to click to enlarge). Before we “closed” on our home, a welcoming party was given us, and one attendee, Frank, retrieved these two earlier images from files at the Historical Society (he was the President at the time). 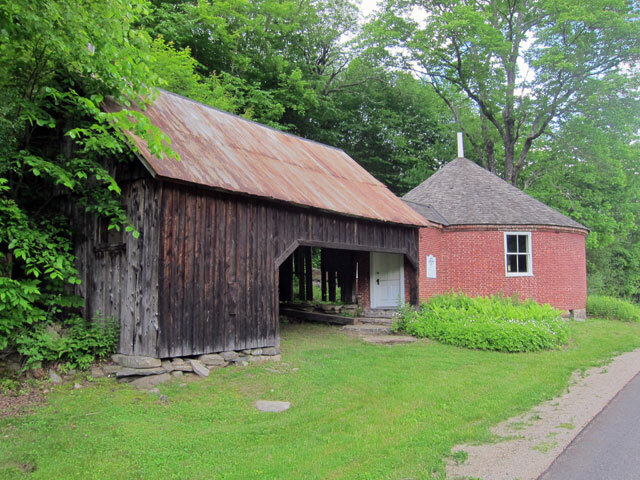 Great image above with my original barn sited when the garage now exists. Ironically in designing my “book shop” addition I came up with something very similar without have seen this image previously. 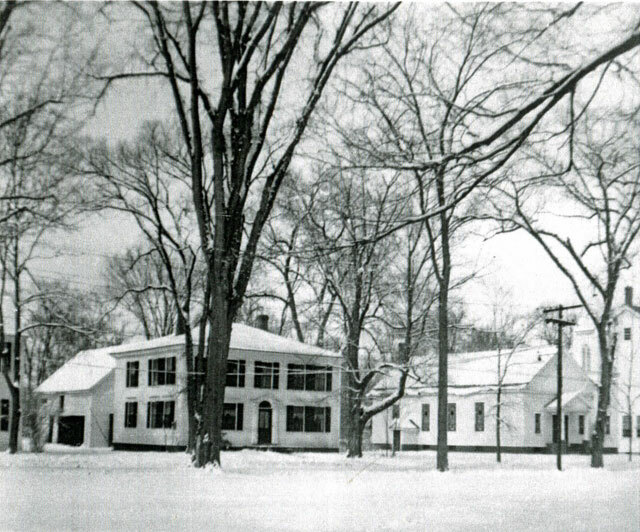 And, below, long before the sugar maple was planted. Note the old “two over two” windows that Guy replaced, and the web lawn chairs and appropriate (not) laundry rack at the end of the drive. The above images are probably from the 1950s. 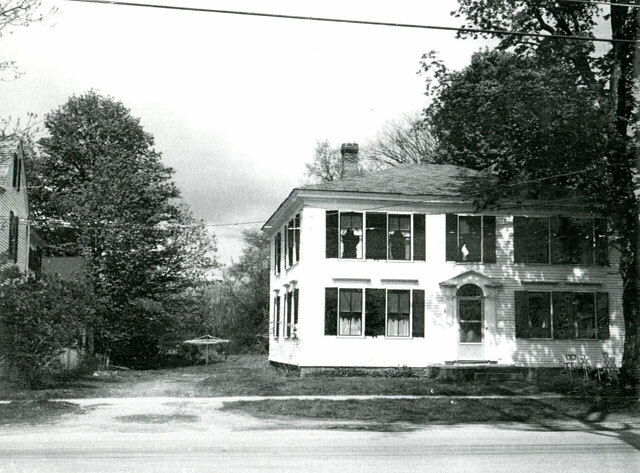 The postcard below would be from the 1940s, and you can just barely see the front porch over the stoop at that time, and a tree in the spot where my late sugar maple was planted in 1970. 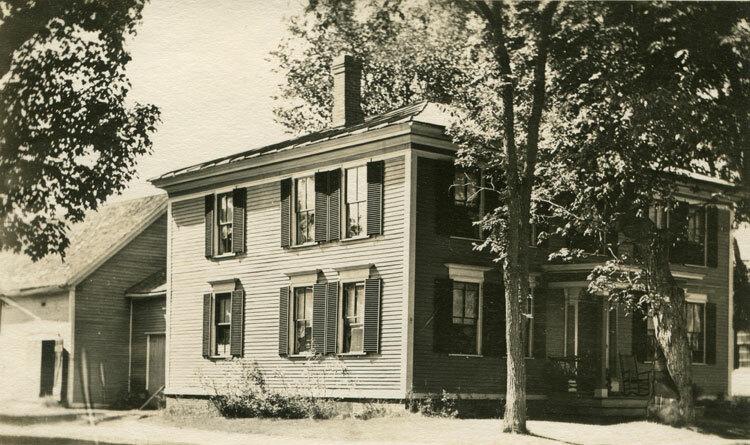 And, this is a wonderful postcard documenting my home in the late 1930s, early 40s, with even another tree in the middle of the front elevation. This “study” of my home, and its trees, is constantly evolving. Today, 9 January 2019, in reviewing some of my image files, I found this view of “44” the church, and the Town Hall. 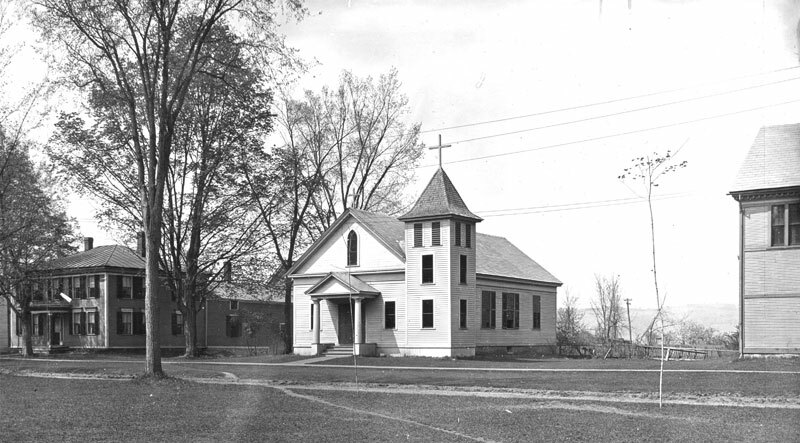 Taken probably in the late 1890s after the chancel portion of the church was extended west, and the portico was enclosed and a tower and smaller porch added. Two of the old pillars were shortened and used for the porch. and, a close-up of “44” from the above image. 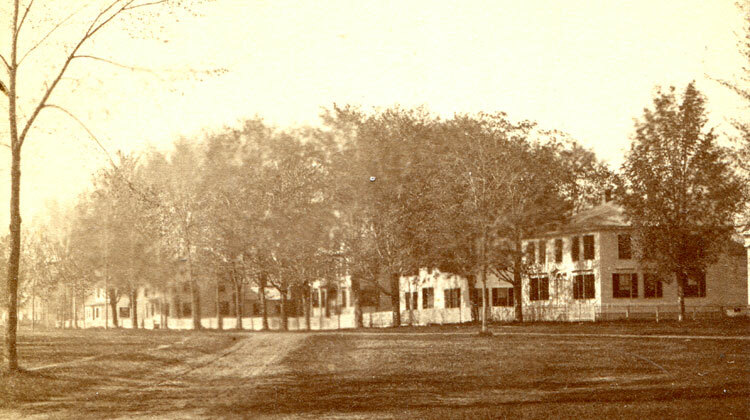 2 – You can see the roads that crossed the Common joining the road on the western side of Washington Square. It was voted in 1887 to discontinue those roads. 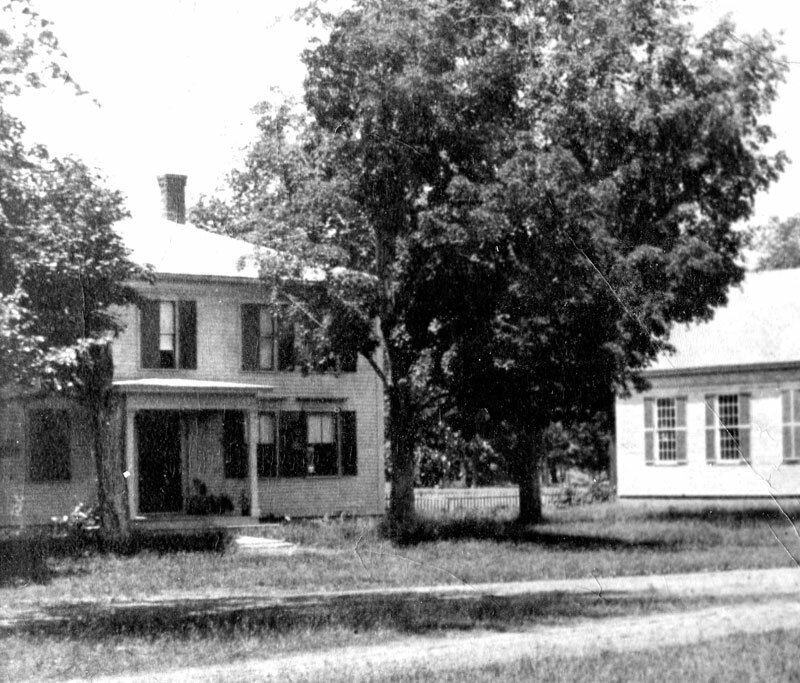 3 – My earliest image of my home from a mid-1870s stereoview shows my home without the portico at the front door. Thus – I date this image from the early 1880s (or very late 1870s). And, a close up. You have listened to me lament not having the time to explore recently (and wear out the tires on BB1 and BB2). Production and directing of GEORGE WASHINGTON SLEPT HERE for Old Home Days has consumed most all of my time. But when we learned a piece of set furniture would not be delivered on Saturday, all of a sudden I had a window of opportunity to “hit the road.” But, what to do? I am out of practice, and planning. BLUE BELLE and I headed out the drive to head north to explore roads in Acworth. At the end of the drive, I turned south. Recently in my collection of great historical ephemera I found a 1958 tourist guide to the “West River Valley Region on Vermont” and you will eventually get a full post on that. In that little 8 page booklet there was one thing I had never heard of, and probably close to 100% of the world’s population is totally unaware of too. Off we went. 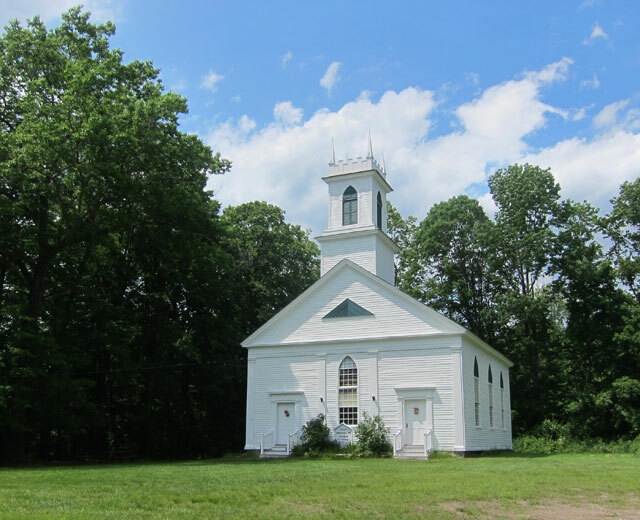 I turned off Route 12 to Route 63 in Westmoreland to River Road, and turned left on Poocham Road – great dirt, winery, and two small cemeteries. 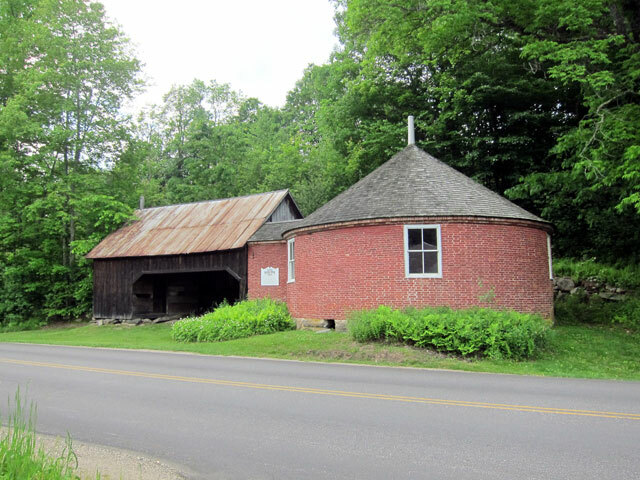 Second time down this road, but this time at the crossroads turned west figuring I would end up in West Chesterfield and close to the Connecticut River. And, soon, there I was at the Universalist Church in West Chesterfield, about only thing there besides Actor’s Theater in the old hall. I was getting hungry, and crossing the river I headed south on US 5. Once before I enjoyed the Top of the Hill Grill in Brattleboro and that became the plan. 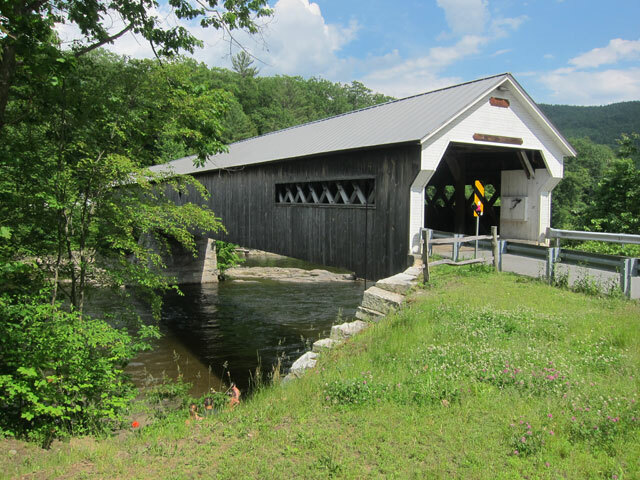 While sitting there looking at the Brattleboro Retreat across the way I decided to head there and up Route 30 toward Newfane instead of taking the back road past Rudyard Kipling’s Naulakha to the Covered Bridge in West Dummerston. It had been a long time since I had been on this initial stretch of Route 30. 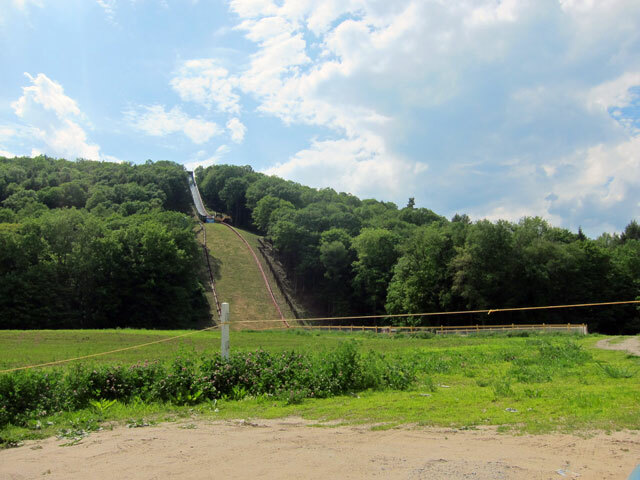 I toured the grounds of the Brattleboro Retreat (no photos allowed), and once I exited I remembered that the ski jump should be close. I choose the first left, and there it was. The Harris Hill Ski Jump completed in 1922. Shortly arriving at the West Dummerston Covered Bridge I need to share a few images with you since you are now “hooked on” covered bridges after my last post. and, looking out at the swimming area under the bridge. and, yes there is a story. 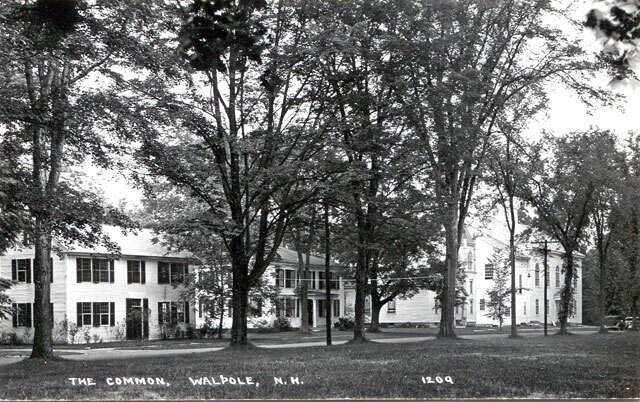 Built in 1822, as recorded in my 1958 booklet, “A certain Dr. John Wilson who taught here had it built according to his specifications with windows facing all directions so that no one could approach the schoolhouse unnoticed. He kept a revolver within easy reach for it was said that he was none other than Captain Thunderbolt, a highway robber long wanted for murder in Scotland and Ireland.” One place I read that 60 students would be in attendance – hard to believe. 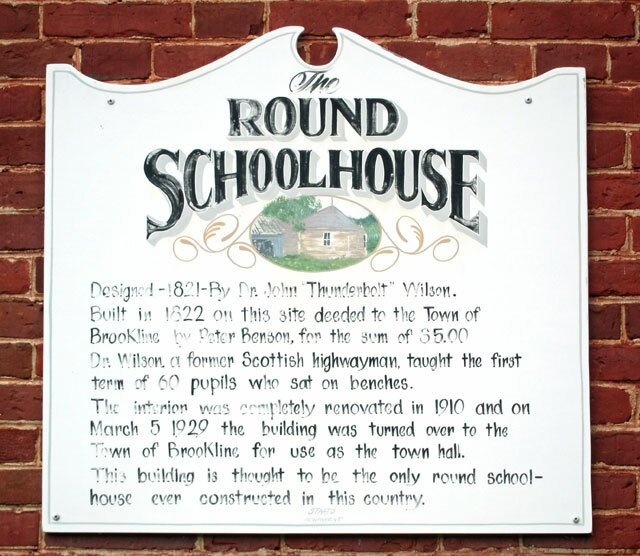 I encourage you to Google the Round School House and Thunderbolt, and even better to visit. 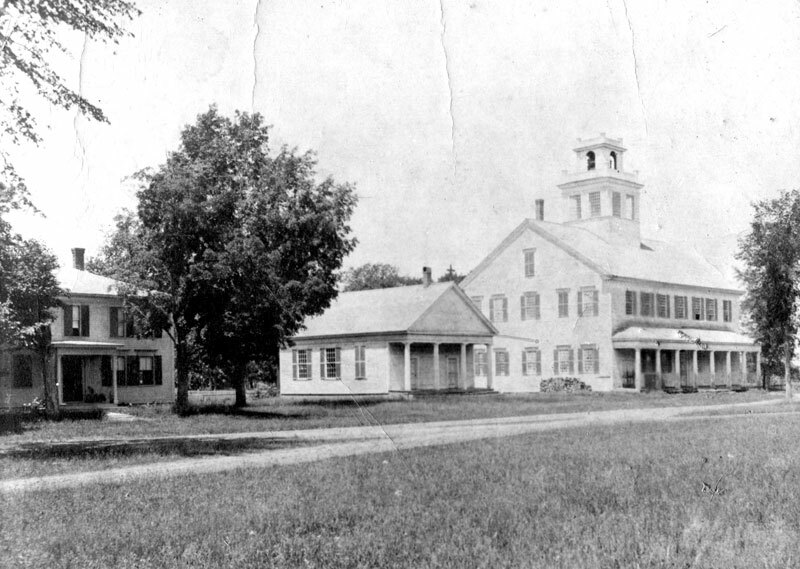 The building served as a school until 1929. I then continued north on Grassy Brook Road towards Athens — and I encourage you to do the same. Just remember, you have to plan to travel this route — it is not along any path that you may just happen to be on. Macadam to dirt, dirt without telephone poles, poles reappear, and you can tell when you are in a more depressed area – Athens. 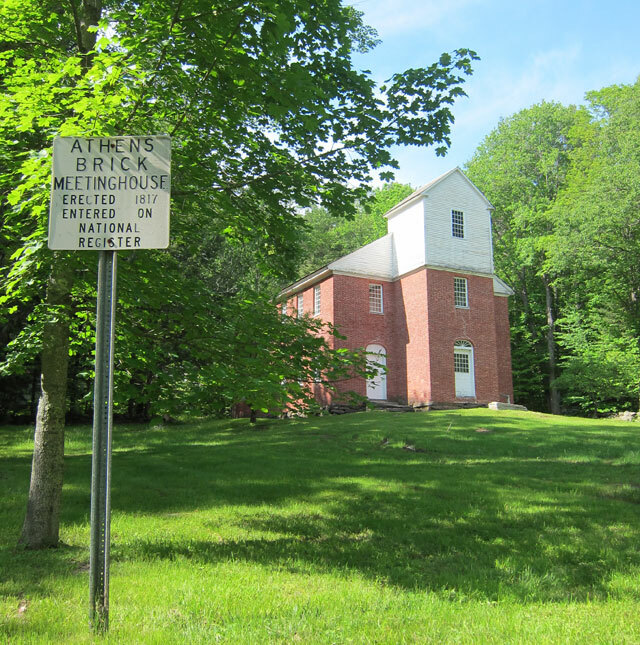 But, up on the hill above a concentration of buildings and the town buildings is the Meeting House (you have to know where to look). 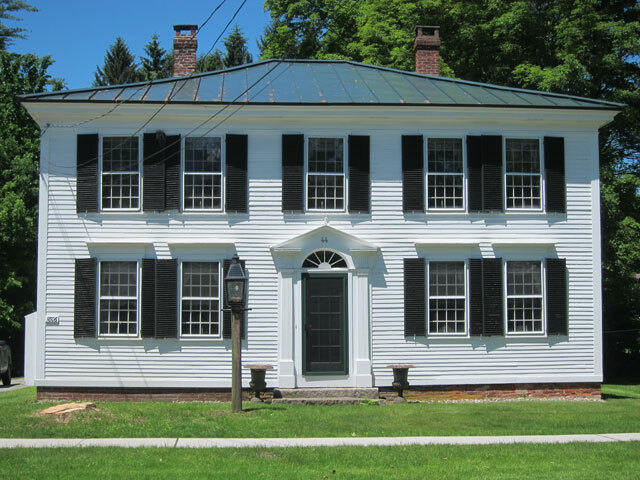 It was interesting to find as I walked around that the back, which you do not see, is clapboard instead of brick. 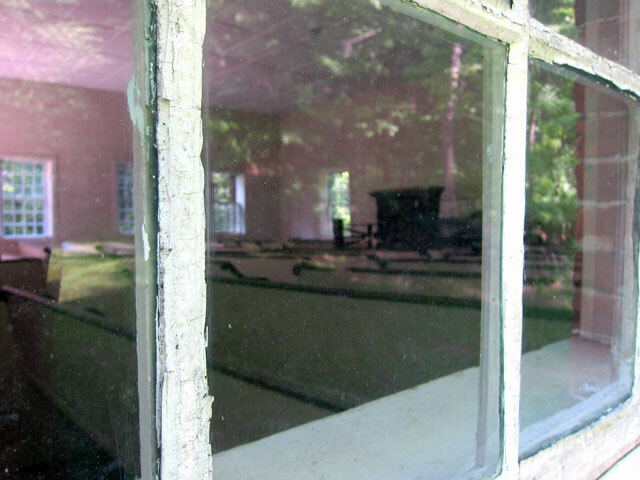 I had a view through the first floor windows, and would love to see the second floor. And then I continued on Route 32 to Cambridgeport, right towards Saxtons River and home. 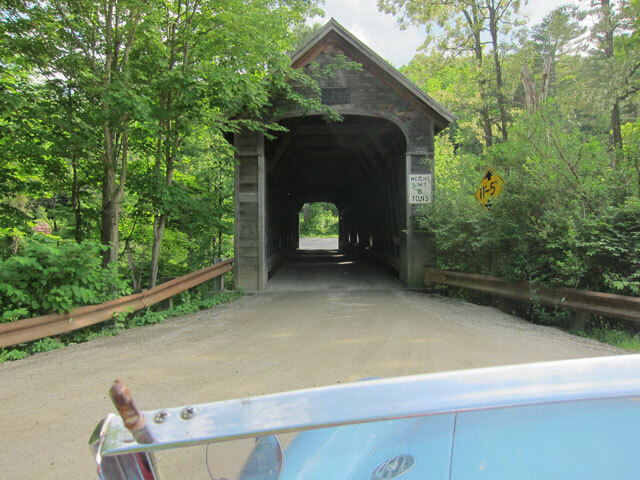 BLUE BELLE had to stop and travel through Hall’s Bridge where we started the last adventure. And, then it was home, but a much needed four hours off. This entry was posted in Day (or maybe two) Trips and tagged Brookline, Round School House, Vermont. Bookmark the permalink. A memorable 4 hours, happy you had the chance to indulge. Short trip for you. Great sojourn for us. Condolences on your tree, but the hoiuse looks beautiful. Will you be planting another tree to replace the old one? Great find on the round schoolhouse! Great history on the teacher as well. Sorry to miss Old Home Days this year; we sure have enjoyed the festivities that weekend. Ray, you and Cathy made a beautiful home and it is still so gorgeous. Sorry about the tree. The new tree looks lovely; it graces your beautiful house. Your line about writing allowing you to relive experiences is particularly apt because this morning an long time friend called to tell me she is writing about people she knew in the 60’s, 70’s……she was verifying some of her memories. I still think your shunpiking belongs in a collection of stories: On the Road with Ray. Guess that answered my question of whether you were going to replace the tree… It looks great! Shade trees are so important to a house’s personality, especially yours with such history. “I think I shall never see a poem as lovely as a tree…” Did you know there is a rest area on the New Jersey Turnpike named after Joyce Kilmer? Kind of incongruous, don’t you think?